ABSTRACT. An updated checklist of the polychaete species described for the Mexican Pacific and an historic review of their study are presented. The taxonomic list includes nomenclature references, data of the type locality and synonyms based on systematic revisions. In the study area, 313 species of polychaetes and 21 genera have been described, of which 278 species are currently valid. Several descriptions (28%) of the valid species failed to indicate the habitat of the type locality. The remaining 199 valid species were described for a large variety of habitats: algae (11 species), mangroves (2), hard bottoms (22), soft bottoms (continental shelf = 65 species; deep sea = 78 species), hydrothermal vents (17), and others (parasites, larval planktonic forms, epitokes) (4). The species descriptions for the Mexican Pacific can be divided into four main periods: the first, during the 1910s, includes mainly Chamberlin's studies of deep sea fauna. The second, in the 1940s, comprises studies carried out by Rioja (intertidal zone) and Hartman (including specimens from the Allan Hancock Foundation collection). The third period began around the 1970s when Fauchald's studies were published and 77 currently valid species were described for western Mexico. The fourth period began in the 1980s and continues to date, being characterized by descriptions of species done mainly by Mexican scientists. The differences in the number of species described during each period and for the different regions of the Mexican Pacific are directly related to the sampling effort carried out along these coasts. 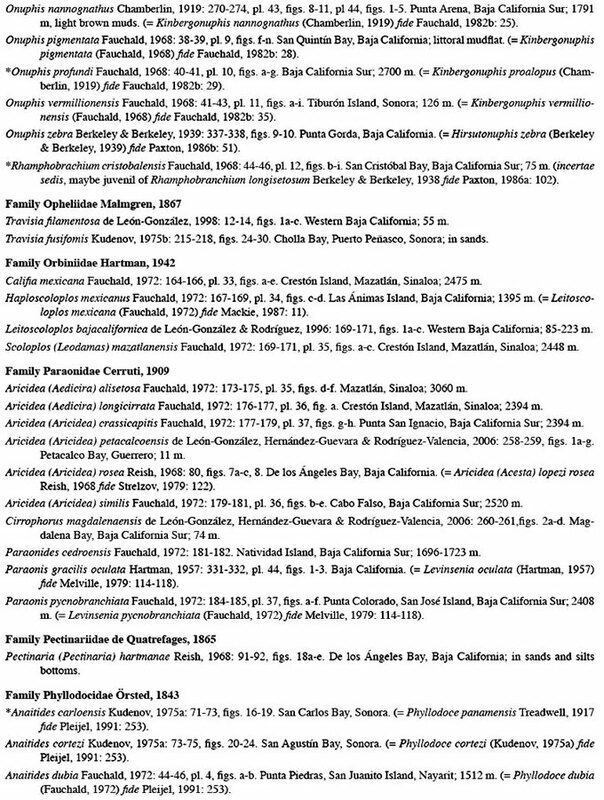 Keywords: Polychaeta, benthos, biodiversity, geographic distribution, Mexican Pacific. RESUMEN. Se presenta una lista taxonómica de las especies de poliquetos descritos en el Pacífico mexicano y una revisión histórica de su estudio. El listado incluye referencias nomenclaturales, información sobre la localidad tipo y sinonimias basadas en revisiones sistemáticas. Un total de 313 especies y 21 géneros han sido descritos en el área de estudio, de ellas, 278 especies son actualmente válidas. El 28% de las descripciones de las especies válidas no incluyeron el habitat de la localidad tipo. Las 199 especies válidas restantes fueron descritas en una amplia variedad de habitats: algas (11 especies), manglares (2), fondos duros (22), fondos blandos (plataforma continental = 65 especies; mar profundo = 78 especies), ventilas hidrotermales (17) y otros (parásitos, formas larvales planctónicas, epitocas) (4). La descripción de especies en el Pacífico Mexicano puede ser dividida en cuatro periodos principales: el primero en la década de 1910 incluye principalmente los trabajos de Chamberlin sobre la fauna de aguas profundas. El segundo, en la década de 1940, comprende los estudios realizados por Rioja en la zona intermareal y por Hartman que incluyó especímenes de la colección de la Allan Hancock Foundation. El tercer periodo se inició alrededor de 1970 en que se publicaron los estudios de Fauchald que describen 77 especies actualmente válidas del oeste de México. El cuarto periodo se inició en la década de 1980 y continúa hasta la fecha, caracterizado por la descripción de especies realizada por científicos mexicanos. Las diferencias observadas en el número de especies descritas en cada periodo y en cada región del Pacífico mexicano están asociadas con el esfuerzo de muestreo llevado a cabo a lo largo de estas costas. Palabras clave: Polychaeta, bentos, biodiversidad, distribución geográfica, Pacífico mexicano. The study of polychaetes in the Mexican seas started during the second half of the nineteenth century, when Kinberg (1857) recorded the amphinomid Hermodice ca-runculata (Pallas, 1776). Unfortunately, he did not record the sampled site precisely, only noting "Mexico" as the sampling location. However, we consider it plausible that the amphinomid was collected in the Veracruz littorals due to the economic importance of the Veracruz Port at the time and because the records show that this species is common in the littoral grassbeds and coral reefs of the Gulf of Mexico (Johnson & Vittor, 1982). Thirty years later, Ehlers (1887) identified Spirobranchus incrassatus (Kr0yer, 1863) in the Bay of Acapulco, the first record for the Mexican Pacific, but it was not until 1904 that Bush described a new species from the Mexican Pacific region: the serpulid Eupomatus humilis, a species currently valid as Hydroides humilis fide Pillai (1972). During the following years, the study of polychaetes in the Mexican Pacific increased, mainly due to foreign oceanographic expeditions and researchers that enriched some of the world's prestigious scientific collections, particularly those of the Los Angeles County Museum of Natural History and the Allan Hancock Foundation, in Los Angeles, California. For the last 24 years, systematic studies carried out by Mexican researchers have increased considerably and shown a consistent and continuous effort in the area. Nowadays, more than 1,100 species of polychaetes have been recorded for the Mexican Pacific; however, most of these studies were done in the Gulf of California, whereas the southern coasts have been comparatively less studied (Hernández-Alcántara, 2002). Initial efforts to summarize the information about polychaetes from the Mexican Pacific were done by Rioja (1941b, 1947b), Salazar-Vallejo (1989a), Hernández-Alcántara & Solís-Weiss (1999), Hernández-Alcántara et al. (2003), and Salazar-Vallejo & Londoño-Mesa (2004). 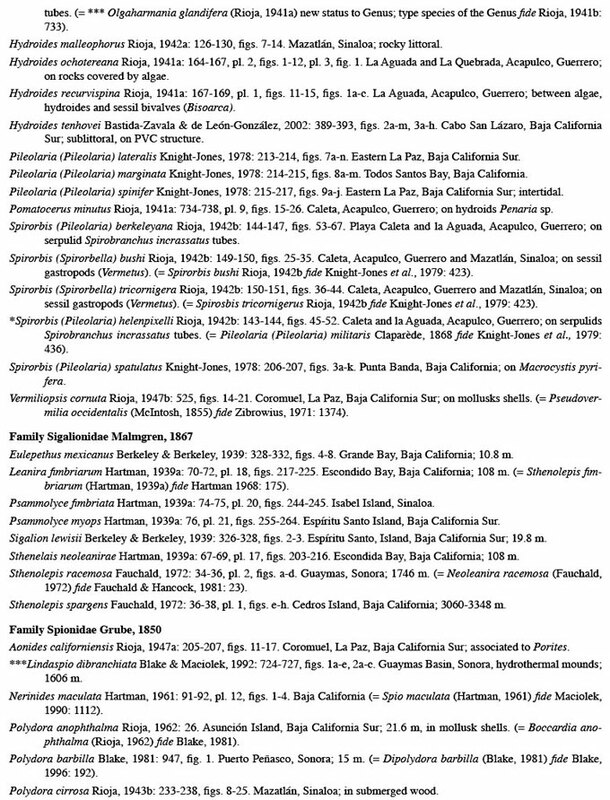 These taxonomic lists are undoubtedly a highly valuable contribution to the knowledge of the polychaete fauna. However, despite this remarkable scientific effort to understand the polychaetae fauna in the region, differences in nomenclature and the criteria for taxa definitions have always been common. This is in part due to the relatively frequent revisions of genus and synonym procedures, but also because the lack of integrati ve taxonomic monographs and updated checklists for this region has caused confusion in nomenclature and in the real distribution ranges of many species. This study aims to present an updated list with the original and currently valid names for the polychaete species whose locus typicus is in the Mexican Pacific, to carry out an historical review, and to analyze the recorded species distributions and habitats. With this, we hope to contribute to the worldwide effort to standardize polychaete nomenclature, in this case, in the Eastern Pacific. The checklist for the polychaete species described from the Mexican Pacific was made following an exhaustive bibliographic review and analysis of the original descriptions. 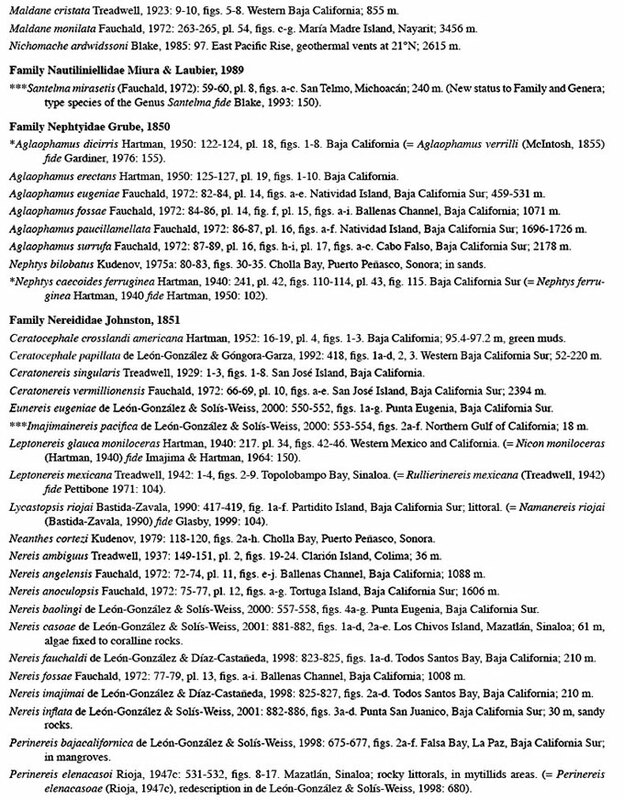 The list includes the nomenclature reference for each polychaete species (original name, year of publication, pages, figures), data for the type locality, depth and habitat (as complete as possible, based on the information in the original description), and the current valid name (citing the author who introduced the taxonomic change). 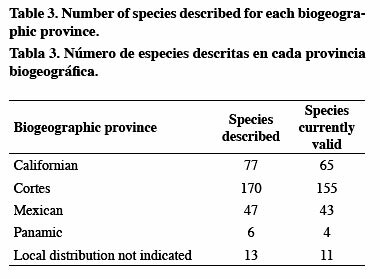 In addition, the number of species for each biogeographic province is indicated. The state to which the type locality belongs is noted only in order to facilitate the search within the country since the political divisions have no biogeographic meaning. At the end of this paper, the complete references of the consulted publications are provided. In this way, we hope to reduce the time invested when further information is needed for other specific objectives. The Mexican Pacific littorals cover 4,054 km and are located between 15° and 32°N, along the Tropic of Cancer, crossing the southern Baja California region (Fig. 1). Its water masses of different origins (arctic, subarctic, tropical, subtropical) (Wirtky, 1967) combine with the diversified physiography to create many habitats: muddy and sandy beaches, rocky shores, bays, coastal lagoons and estuaries, about 240 islands and islets of different origins and geological ages, mangroves and seagrass beds, and even active expansion centers in the bottoms of the central zones with their corresponding hydrothermal vent areas (Guaymas Basin and 21°N). The different marine regions in the Mexican Pacific are separated by steep thermal gradients to the north and south and by an area of open ocean (East Pacific Barrier) to the west. The boundaries of the biogeographic provinces used herein are taken from several authors: Briggs (1995), Hendrickx (1992), and Hastings (2000), who separated them on the basis of the distribution patterns of fishes and marine invertebrates. 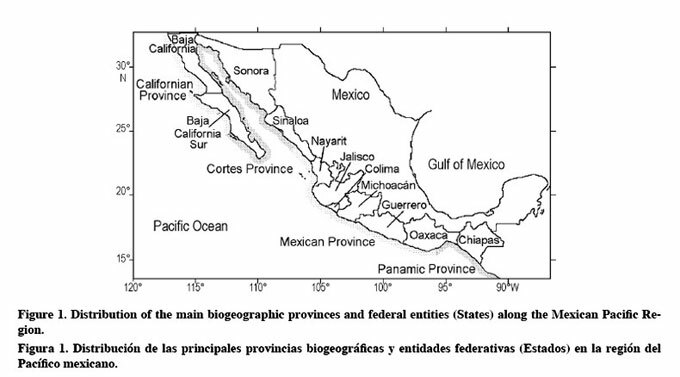 The northwestern littorals of Mexico are environmentally classified as warm-temperate and belong to the Californian biogeographic province which goes from south of Point Concepción (near Santa Barbara, California) down to northern Magdalena Bay, southwest of the Baja California Peninsula (Brusca, 1980; Hastings, 2000) (Fig. 1). The topographic characteristics of the Baja California Peninsula shoreline protect it from the cold southbound California Current and help to create a warm-temperate area along the southern California coasts (Briggs, 1995). The Tropical Eastern Region extends from the Gulf of California southward to northern Peru, where a fauna with tropical affinities dominates (Brusca, 1980; Hastings, 2000). In the Mexican Pacific area, the tropical region encloses the Cortes, the Mexican, and the Panamanian biogeographic provinces. The Cortes Province corresponds to the Gulf of California, including the entire eastern and most of the southwestern coasts of the Baja California peninsula. The Gulf of California is primarily tropical in origin but could well be considered subtropical: its northernmost areas are primarily populated by eurythermal tropical species, whereas the southern fauna gradually evolves spatially to a more typical tropical biota (Brusca, 1980). The Mexican Province includes the coasts from Mazatlán (Sinaloa) down to the Isthmus of Tehuantepec in southern Mexico. At about 16°N, in the northern part of the Gulf of Tehuantepec, another faunal change can be observed; the area from that point southward to the Gulf of Guayaquil (3°S) is known as the Panamic Province (Briggs, 1995). In the Mexican Pacific, the number of polychaete species recorded to date is approximately 1,100 (Hernández-Alcantara, 2002); of these, 313 species (278 currently valid) and 21 genera have their locus typicus in the Mexican Pacific (Table 1). The serpulid Eupomatus humilis (currently valid as Hydroides humilis) (Bush, 1904) was the first species found whose locus typicus is in the Mexican Pacific. 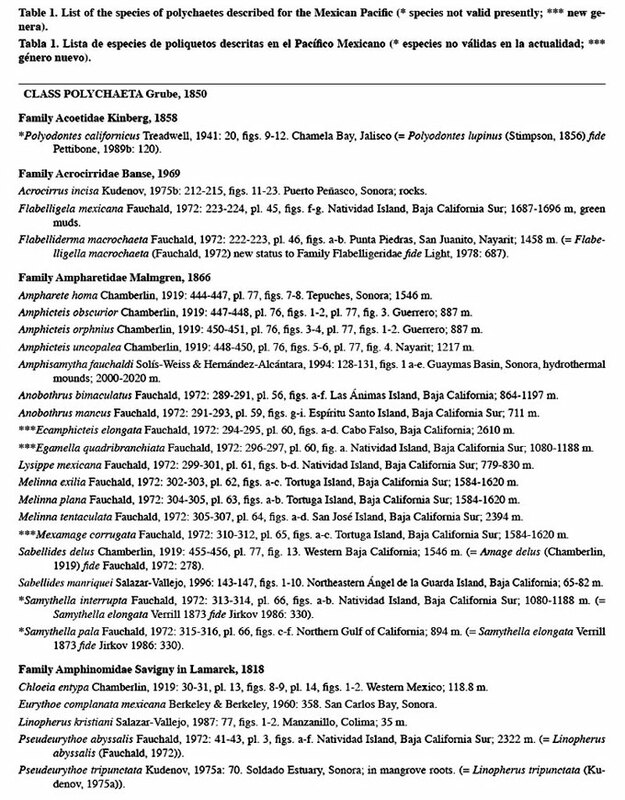 During the twentieth century, significant contributions were made to the taxonomy of Mexican polychaetes and 313 polychaete species, grouped in 162 valid genera and 41 families, were described. As our knowledge on the systematics of the group have increased, the taxonomic status has changed frequently and so, of the original 313 species described, only 278 polychaete species are valid nowadays. 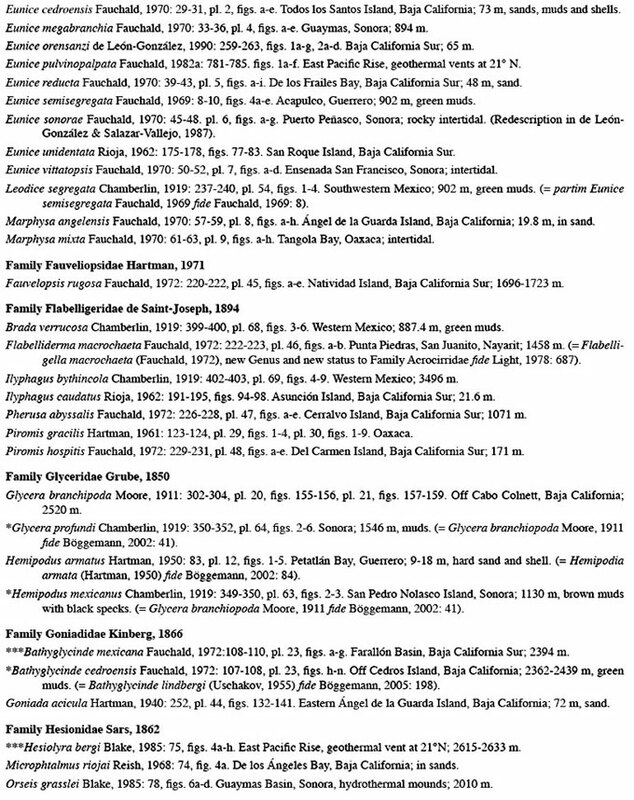 Species belonging to the families Acoetidae (Polyo-dontes californicus) and Lopadorrhynchidae (Lopador-rhynchus parvus) have been synonymized; therefore, these families have no new species in the Mexican Pacific region. 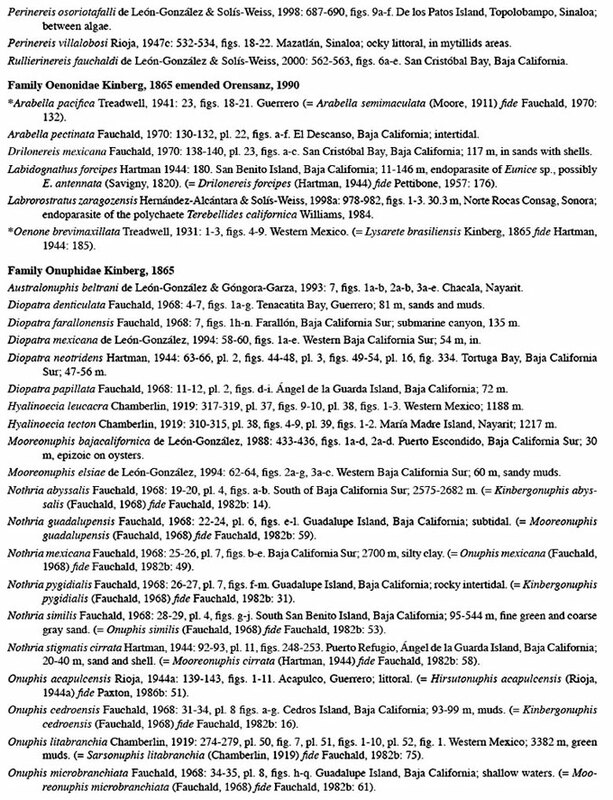 In 1969, Hartman established the family Sabel-longidae for the genus Sabellonga (as monotype) and the species Sabella disjuncta, collected at 115 m in Cedros Island, Baja California. However, according to Fitzhugh (1989), Hartman interpreted the ventral lips or maybe the ventral sacs, as palps, and the species type (S. disjuncta) lacks a tentacular crown but uncini and chaetae resemble those found in Sabellidae. He then concluded that the genus Sabellonga is a member of the family Sabellidae. The taxonomic status of 56 species has changed (Table 1), but they are still considered to be valid. For three of these species, taxonomic adjustments have been made at the family level: according to Blake (1993), Pilar gis mirasetis, initially included in the family Pilargidae, belongs to the genus Santelma, in the family Nautiliniellidae established in 1993 by Blake; Flabelligella macrochaeta (Flabelligeridae) is a member of the family Acrocirridae by Light (1978); and the serpulid Hydroides glandiferum is a type of the genus Olgaharmania by Rioja (1941b) within the Serpulidae. Considering the number of currently valid species, the Nereididae and Onuphidae are the richest families (24 species each), followed by the Polynoidae (19 species), the Serpulidae (17 species), and the Ampharetidae and Lumbrineridae (16 and 15 species, respectively) (Table 1). For 100 species, of which 79 are valid, the habitat of their type localities was not indicated in the original description. However, the distribution of the remaining valid species on the soft bottoms of the study area shows that 65 valid species (23%) were collected on the continental shelf and 78 valid species (28%) in the deep-sea. 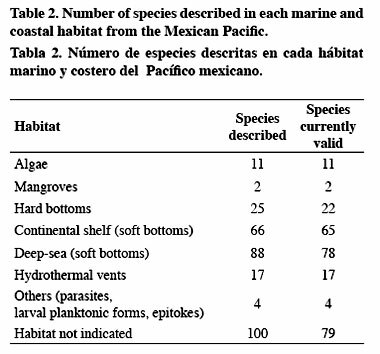 The remaining habitats recorded include less species: 22 species on hard bottoms from the littoral and sublittoral zones, 17 species from the hydrothermal vents both at Guaymas and 21°N, and 17 species in other habitats (Table 2). According to their locus typicus, the number of poly-chaete species varies in each geographic zone. 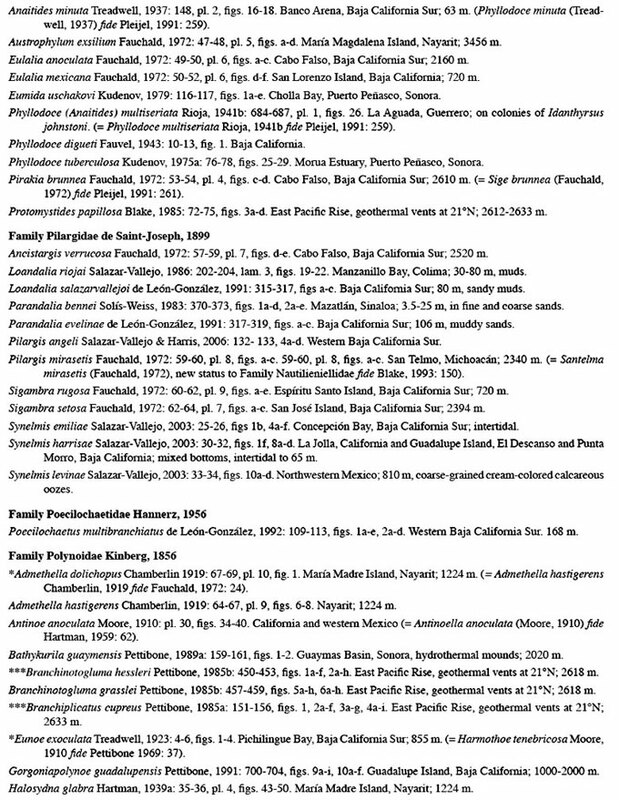 In the warm-temperate Californian Province, 65 valid species have been identified; in the Cortes Province, with sub-tropical conditions, the number of species is the highest (155 valid species); finally, the Mexican Province in the southern Mexican Pacific (tropical characteristics) had 43 valid species (Table 3). Studies of the polychaete fauna distributed along the southern border of the Mexican Pacific (Panamic Province) are scarce and only four new valid species from this area have been identified. 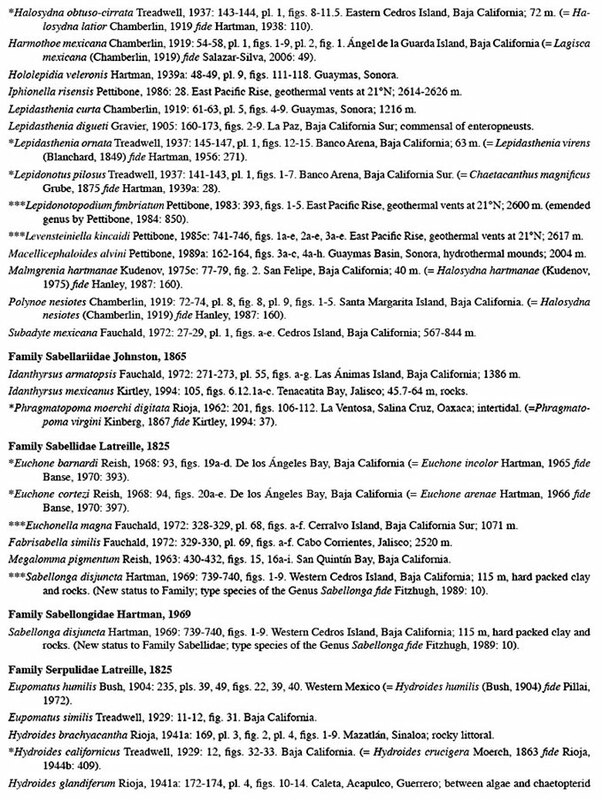 Practically all the type material of the polychaete species collected in the Mexican Pacific has been deposited in foreign institutions, particularly in the United States National Museum (USNM); Smithsonian Institution, Washington, D.C.; the Los Angeles County Museum of Natural History, Allan Hancock Foundation (LACM-AHF); and the American Museum of Natural History, New York (AMNH); but also in the Museum of Comparative Zoology, Harvard University (MCZ); the Museum National d'Histoire Naturelle, Paris (MNHN); and the British Museum of Natural History (BMNH), London. In Mexico, four official collections exist and all belong to research institutes associated with the best universities in the country. However, these collections are not a product of a national policy that recognizes the importance of this work. Two of the polychaete collections are in the Universidad Nacional Autónoma de México (Mexico City); these are in the Laboratorio de Ecología y Biodiversidad de Invertebrados Marinos, Instituto de Ciencias del Mar y Limnología, and in the Laboratorio de Invertebrados, Facultad de Ciencias. The other collections are in the Laboratorio de Zoología de Invertebrados no Arthropoda of the Universidad Autónoma de Nuevo León (Monterrey, Nuevo León State) and the Laboratorio de Poliquetos, Colegio de la Frontera Sur (Chetumal, Quintana Roo State). Since Bush's 1904 description of the serpulid Eupomatus humilis (now Hydroides humilis) for Mexican waters, 37 researchers have participated in describing 313 species (278 valid species) whose locus typicus is in the Mexican Pacific. Fauchald (93 species currently valid), Rioja (31 species), Hartman (24 species), and de León-González with different co-authors (26 species) have made the largest contributions (Table 4). In the beginning, polychaete studies were mainly the result of sampling done during foreign oceanographic expeditions and by researchers who visited different sites along the Mexican coasts. The expeditions of the U.S. Fish Commission Steamer Albatross (1888-1905), marked the beginning of the oceanographic and biological studies in the region. The last of these expeditions were directed by the famous naturalist Alexander Agassiz and were the most important for the study of the Mexican Pacific polychaetes. These expeditions enriched scientific collections worldwide and important taxonomic information on the deep sea polychaetes from the Albatross collections was later published by Chamberlin (1919), Treadwell (1923, 1929), and Fauchald (1972). The Italian expeditions made on board the Liguria (1903-1905) included sites in western Mexico; as part of these cruises, Rosa (1907, 1908) described species of the planktonic families Tomopteridae and Alciopidae. From 1923 to 1938, the Department of Tropical Research of the New York Zoological Society made several expeditions on board the Templeton Crocker and Zaca & Treadwell (1931, 1937, 1941, 1942) identified the polychaetes collected from these research cruises, including pelagic species. Berkeley & Berkeley (1939, 1960) identified the polychaetes collected by the Stranger expeditions (1934, 1937) in Mexican waters. 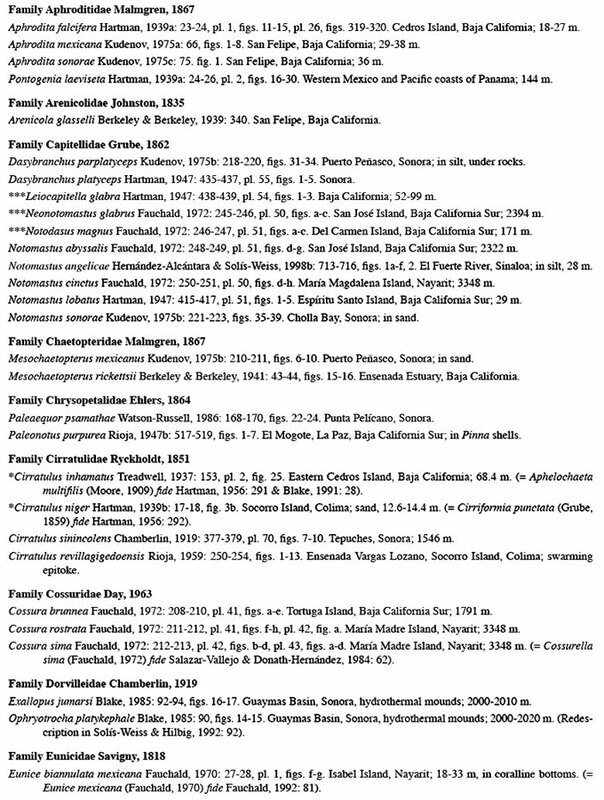 Hartman (1939a, 1939b, 1940, 1941, 1944) analyzed the polychaetes deposited in the Allan Hancock Foundation collection, synonymized several species identified previously by Treadwell, and described material collected from 1931 to 1941 as part of the Pacific Expeditions on board Velero 111 and Velero IV. Later, Fauchald (1968,1970) published a monography on the Eunicea from western Mexico, including specimens from the Velero expeditions, and, in 1972, as part of his PhD thesis, analyzed all the polychaete material in the Allan Hancock Foundation collection distributed in the Mexican Pacific. 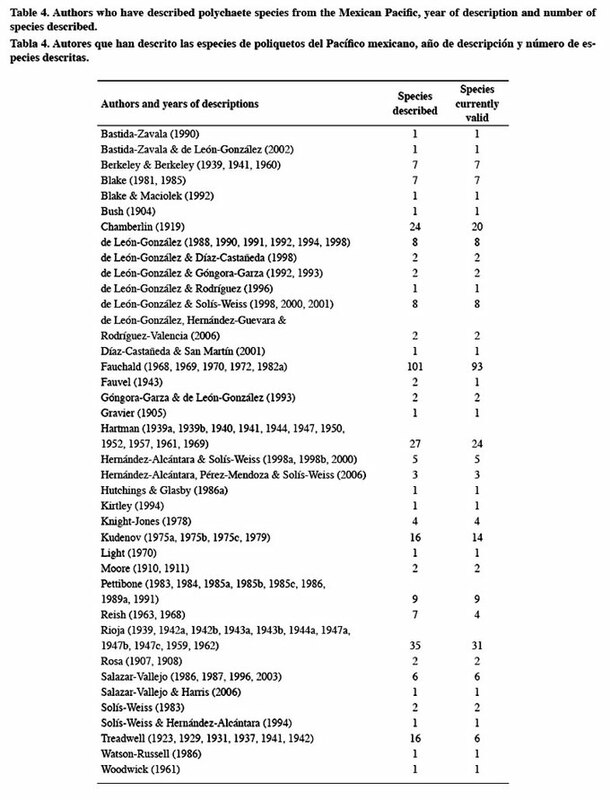 Rioja, the first researcher settled in Mexico, described 35 new species (31 presently valid) whose locus typicus are basically in Acapulco (Guerrero), Mazatlán (Sinaloa), and La Paz (Baja California Sur) (Rioja, 1939,1947a, 1947b) (Table 4). This faunal material was manually collected in the intertidal zone as part of numerous scientific expeditions. Unfortunately, Rioja's collection was never found and one of us (VSW) can assert that it does not exist. In 1981, our group began the organized sampling of polychetes on board the R/V El Puma in the sublittoral zone of the Mexican Pacific that continues to this day. The information about the polychaete fauna collected in these oceanographic expeditions has been mainly published by Solís-Weiss, de León-González, and Hernández-Alcántara, each with different co-authors (Table 4). Up to now, 30 new polychaete species have been described for the continental shelf area and hydrothermal vents. Thus, the historical contributions in the description of new species in the Mexican Pacific can be grouped into three main periods (Fig. 2). The first, at the end of the 1910s, was the result of Chamberlin's (1919) studies on the deep water biological material from the Tropical Pacific (20 currently valid species). The second, in the 1940s, was mainly due to Rioja's (1941a, 1941b, 1942a, 1942b, 1943a, 1943b, 1944a, 1947a, 1947b, 1947c,) and Hartman's (1940; 1941; 1944; 1947) publications. Rioja focused on the intertidal zone (24 new species), whereas Hartman analyzed part of the Allan Hancock Foundation collections (13 new species still valid) in the littoral and sublittoral zones. The third period began around the 1970s, when Fauchald's studies were published (1970, 1972), with 77 presently valid species from western Mexico, most (63 species) from the Gulf of California. Beginning in the 1980s, most descriptions have been made by Mexican scientists in all regions of the Mexican littorals (Table 4). 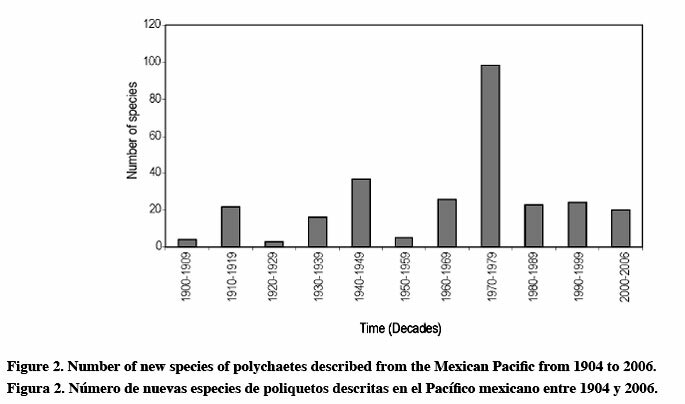 In fact, in the last 24 years, 10 Mexican authors have participated in the description of new polychaete taxa at a rate of about two species per year (Fig. 2), an important effort in a country where taxonomic studies are generally hindered by economic and political problems. 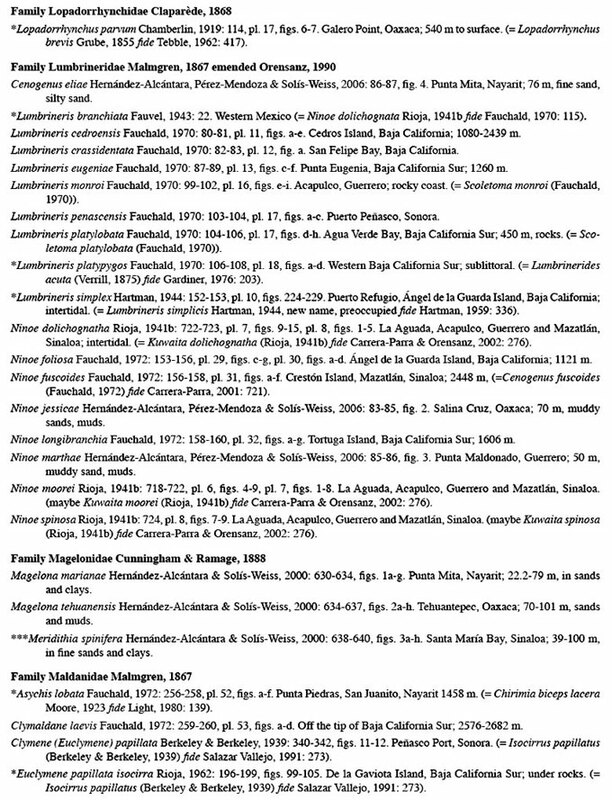 The description of 313 species (278 currently valid) from the Mexican Pacific over the last hundred years at a rate of 2.79 species per year is largely due to the monumental work done by Fauchald in the 1970s. He alone described 93 of the currently valid species (34%), which is more than a third of the total. 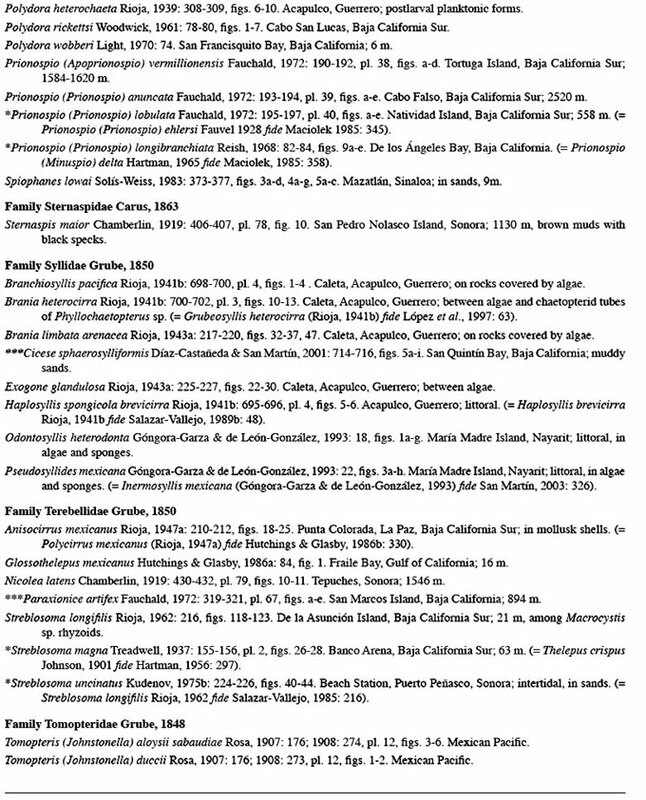 These contributions made Mexico's Pacific zone the region with the largest number of described taxa in the country. From 1980 on, the rate of new species described decreased to two species per year due to a reduction in sampling and in taxonomic studies carried out after Fauchald's work and not because fewer new species remain to be described in the Mexican littorals. In fact, in 2006, four new species were described (Hernández-Alcántara et al., 2006; Salazar-Vallejo & Harris, 2006). Thus, we can state that the polychaete species richness in the Mexican Pacific is still underestimated and that the sampling effort has been uneven, mainly concentrated in the Gulf of California. This trend is the same when the number of authors and publications in each region of the Mexican Pacific are considered, suggesting that the number of described species in each of the regions is more an artifact than a biological phenomenon. As more studies are carried out in a specific Mexican Pacific region, the species number described for that region increases. Similarly, the highest numbers of species recorded for the families Ne-reididae, Onuphidae, and Polynoidae reflect the individual interests of the authors for a particular group. Faunal affinities among Pacific regions should also be cautiously analyzed since the habitat distribution data shows that the sampling effort has been predominantly carried out over "soft bottoms". Therefore, we predict many new descriptions when more samplings are done in algae, mangroves, or hard bottoms, or when the possibility of conducting deep-sea or hydrothermal vent studies can be increased; these deep-water habitats are characterized by unique environmental features, but also by difficult conditions and the need for complex sampling methods. These facts suggest that additional polychaete taxonomic studies could significantly change the interpretation of the currently accepted distribution patterns and affinities among the different biogeographic provinces. This study shows that, despite the relevant results already obtained in this field, the magnitude of the polychaete biodiversity in the Mexican Pacific has yet to be assessed and needs a sustained effort over time and space. The Mexican littorals are constantly altered by human actions, especially in recent times, making the need to increase this effort urgent, not only in order to evaluate the biodiversity, but also to monitor and study those alterations. The discovery of more new species will probably be related to a greater extent to studies in southern Mexico, in the Mexican biogeographic province, a marine zone where polychaete records are still unknown. Received: 20 May 2005; Accepted: 11 March 2008. * This work was presented at the XXV Congreso de Ciencias del Mar de Chile and the XI Congreso Latinoamericano de Ciencias del Mar (COLAC-MAR), in Viña del Mar, 16-20 May 2005.